Much research has been conducted in the area of assisted transportation from a variety of sources including non-profit organizations, government agencies, and research centres. These reports can provide valuable background information that can guide your organization’s development of a responsive and sustainable assisted transportation service. The following reports contain information on the factors essential to developing a “senior friendly” service, seniors’ transportation habits and unmet transportation needs, available ride-scheduling software programs, and the different models used in developing a coordinated service. Using focus group research, the Beverly Foundation identified five factors that are essential to "senior friendly" transportation. These five factors are known as the 5 A's of Senior Friendly Transportation and are widely accepted as criteria for assessing the usability of transportation services by older adults. These factors are Availability, Acceptability, Accessibility, Adaptability, and Affordability. 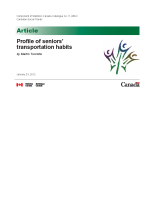 Using data from the Canadian Community Health Survey – Healthy Aging (conducted in 2008-2009), Turcotte profiles Canadian seniors’ transportation habits. The report includes information on seniors’ access to transportation and driving habits, as well as seniors’ main forms of transportation, and the impact of transportation on levels of social participation. 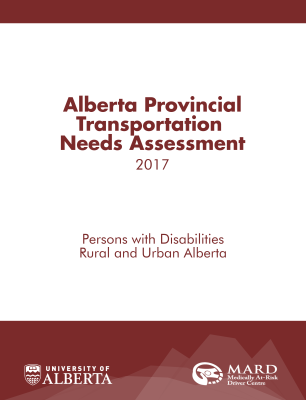 In 2016-2017, the MARD Centre conducted a Provincial Transportation Needs Assessment of seniors and persons with disabilities (PWD). The overall goals were to: 1) assess the transportation needs of seniors and PWD, and 2) make the results available to communities throughout the province in order to help them understand and better address the transportation needs of seniors and PWD in their communities. 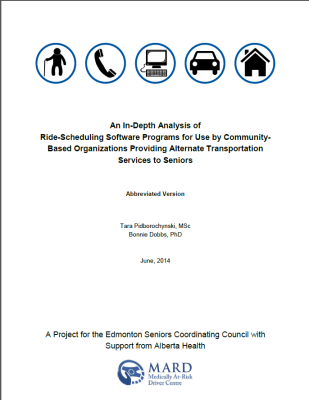 In 2014, the MARD Centre, with funding from the Edmonton Seniors Coordinating Council, conducted a search of existing ride-scheduling software service providers that are available for use by community-based organizations providing transportation services to seniors. The In-Depth Analysis of Ride-Scheduling Software Programs report provides an overview of the identified service providers and compares and contrasts the features and capabilities of service provisions across the different software programs. 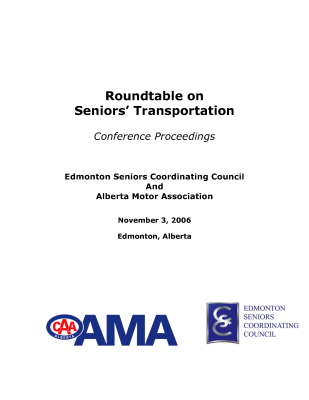 In 2006, the Edmonton Seniors Coordinating Council and the Alberta Motor Association partnered to host a Seniors Transportation Roundtable on the recommendation of Edmonton Mayor Stephen Mandel. Over 80+ delegates representing 25 senior-serving agencies, traffic safety decision makers, government and municipal policy makers, transportation service providers and funding organizations gathered to discuss seniors’ transportation. Through discussion, several short-term and long-term ideas were suggested to improve transportation services in Edmonton. One of the outcomes of the Seniors Transportation Roundtable was the development of a planning and steering committee. This committee was formed to take the ideas generated from the Roundtable and put them into action by developing a set of recommendations put forth to the City of Edmonton. Work has been ongoing on these recommendations and has led to the development of the AMA Driving Angels, the Online Listing of Alternate Transportation Providers, the Seniors Transportation Information Guide, the Coordinated Shared Services Model Report, and Drive Happiness. 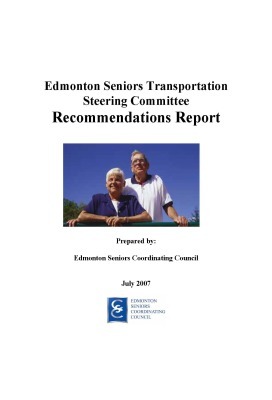 In 2010, as per the recommendations from the Seniors Transportation Committee Recommendations, the ESCC contracted Greenaway Consulting Services Ltd. to undertake the development of an Coordinated Shared Services Model for seniors assisted transportation. The model development process was based on a review of current local literature and scan of available services, research into alternative transportation systems outside of Edmonton, good practices in alternative transportation, ride management software systems and promising practices for coordinating assisted transportation systems. 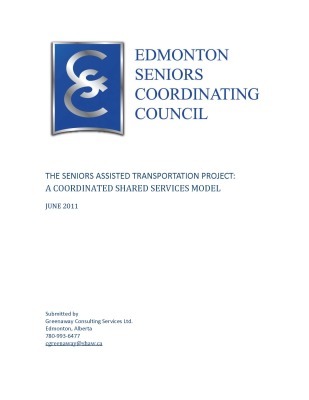 The Seniors Assisted Transportation Project continued its work on implementing this model and resulted in a collaboration between three volunteer-driving organizations with support from the City of Edmonton, Age Friendly Edmonton, and Alberta Health. In 2014, Drive Happiness, a door-through-door assisted transportation service was officially launched.